We started a morning basket back in September and honestly it didn’t last long. I set too high expectations. I added too many things and made it basically impossible to reasonably complete what I put in it- much less to enjoy it. So, I abandoned the idea and figured it just wasn’t a good fit for us. 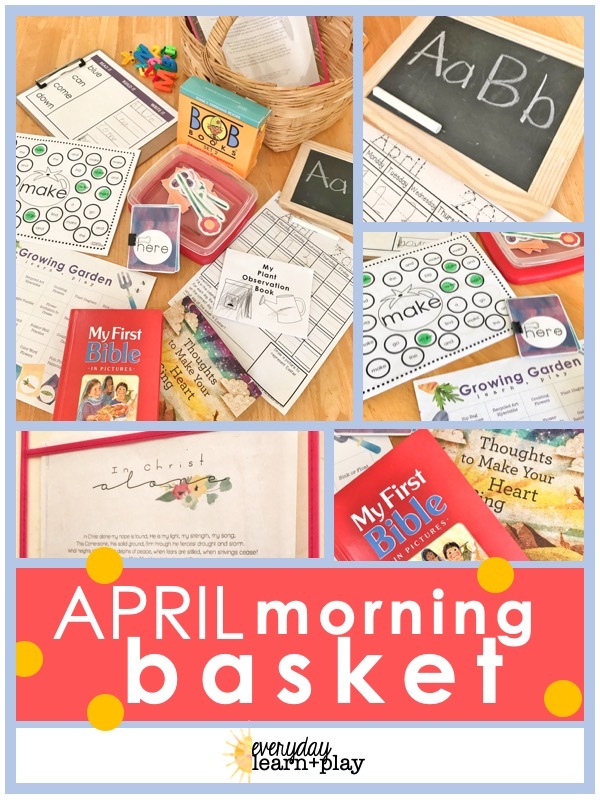 After joining a morning basket group and seeing so many fellow homeschool mamas using a morning basket I decided we’d give it a go again. This time with a much more minimalist approach and knowing our homeschool rhythm I feel a lot more confident about using it. If you’re on the fence about one here’s my advice. Start small, keep it simple, and don’t get hung up on having it perfect. This is what we keep in our morning basket and how we use it each day. For me it’s important that I start the day with “quiet time” (although it’s rarely quiet.) I love @wellwateredwomen ‘s quote, “Word before world.” Every morning looks different but to some degree I want to spend time reading scripture. Similarly, I like to start the day with my littles by reading a Bible story or devotional. This month we’re reading a short story from the My First Bible in Pictures by Kenneth Taylor coupled with a reading from Thoughts to Make Your Heart Sing by Sally Lloyd Jones. I also LOVE @happyhymnody ‘s hymn of the month guide. So we’re learning/singing In Christ Alone to start our days as well. Typically I do our Learn + PLAY calendar activities in the afternoon- they make a great post-nap play time. However, this month I’m changing it around and adding just one activity each day to our morning basket. If it’s more involved (i.e. paint, sensory bin, etc) I’ll save it for the afternoon and use a bonus activity instead but for the most part the activities suit well for our morning basket. My kindergartener goes through pre-primer sight words and has been doing the expansion activities from my Sight Word Learn + PLAY set. I want some of the morning basket time to be independent time. It gives me a few minutes to help my toddler with his breakfast, wash up dishes, and get us set for the day. I put a small chalkboard in the basket along with a set of Bob books. My 4 year old preschooler loves to doodle on the chalkboard and my Kindergartner loves reading Bob books. They are perfect to build her confidence as a reader. She can read them completely independently. I include my traceable calendar in the basket as well so we talk through what day/month it is and what our plans are for the day. I’m really curious to know, do you do a morning basket? What do you include and how do you tie it into your daily rhythm? I hope this has been helpful and encouraging! Have any questions I didn’t answer? Send me email an hello@everydaylearnandplay.com I’m always happy to connect with you! Looking for inspiration and something fun to kick off your weekends? Sign up for my weekly email list to receive new printable activities every Friday!